Vice admiral De la Puente was born in Cádiz, on May 19th 1958. He joined the Navy on August 16th 1977 and graduated as Lieutenant Junior Grade in 1982. As Lieutenant Jr. Grade and Lieutenant, De la Puente embarked on the frigates ‘Baleares’, ‘Numancia’, ‘Asturias’ and the destroyer ‘Churruca’. 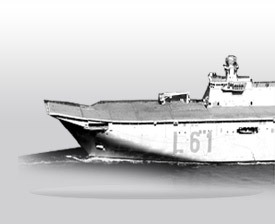 From 1991-92 he commanded the patrol boat ‘Laya’. He was promoted to Lieutenant Commander in 1994 and assigned as Chief of Operations of the ‘Alfa Group’ Staff. From 1998 to 2000 he was the first commanding officer the minehunter ‘Sella’. In 2001 he was promoted to Commander, and in September 2003 appointed Prospective Officer of the frigate ‘Blas de Lezo’ (under construction) taking command of this ship when she was commissioned in December 2006, subsequently conducting CSSQT missile launching sea trials in San Diego (USA) and participating in the Standing NATO Maritime Group two (SNMG-2) in the Mediterranean Sea. As Captain he was CO of the Spanish Navy training ship ‘Juan Sebastián de Elcano’ from 2009 to 2011. Among other ashore assignments, VA De la Puente was lecturer at the Instruction and Training Centre, and instructor at the Fleet’s Combat Assessment and Qualification Centre (CEVACO). In 2001 he was assigned to the Operations Division of the Spanish Navy Staff, subsequently returning to the CEVACO for assessment trials of the F-100 frigate ‘Álvaro de Bazán’. After his tour of duty as CO of the frigate ‘Blas de Lezo’ he was posted to the Logistic Division of the Naval Staff. From May 2007 to September 2009 he was Chief of the Operations Section of the Naval Staff, and Chief of the Programs Section of the Logistic Division in 2011. On January 23rd 2012 he was promoted to Rear admiral and appointed Fleet Chief of Staff. In August 2013 he was appointed Chief of the Canary Islands Naval Command. On September 4th 2015 he was promoted to Vice admiral and appointed Maritime Action Admiral. Vice admiral De la Puente Mora-Figueroa is a specialist in Artillery and Naval Gunfire and a Naval Warfare graduate (1996). VA De la Puente is married and has three children.